As we have arrived into 2019, it is time to look ahead to forecasted changes and prices rises in the grain and fertiliser industries and the ways grassland farmers can prepare for reseeding. As we have well and truly entered 2019, we are looking ahead to predicted changes and price rises in the grain and fertiliser sectors this year, as well as looking at how grassland farmers can be prepared to begin reseeding once the opportunity arises. Grain Prices have stayed very static of late, with very little movement due to being undermined by cheap maize, which is really putting a damper on the market. Looking a current world grain market prices, it is leaving a forward grain price for next September at 20% moisture in the region of €160/tonne and €170/tonne for barley and wheat respectively. 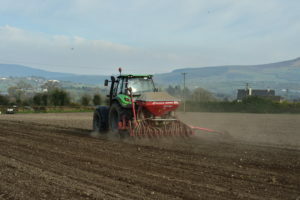 Fertiliser prices look set to rise in the region of €50/tonne for the coming season with CAN looking very likely to be close to €300 per tonne and Urea in the region of €385 per tonne in bags delivered. The rise has been blamed on slightly higher gas prices, strong demand and scarcity of product as there are now fewer manufacturing plants worldwide. Due to last year’s drought, many reseeding plans were put on the back burner. Before the busy calving period begins, now would be an excellent time for farmers to walk their grassland and put a plan in place for the fields in need of reseeding the most. Choose the fields that have little or no ryegrass as a percentage of the grass in the sward and earmark them for reseeding. Once you have picked the worst 10-20% of the total farm area, put a plan in place and take a soil test straight away if there are no up to date soil tests available. Once the first opportunity arises to begin the reseeding process this year, you are armed and ready to go! For more information on grain prices, fertiliser and reseeding, or for assistance, contact the RED MILLS agronomy team or call into our Agri Super Store in Cillin Hill.